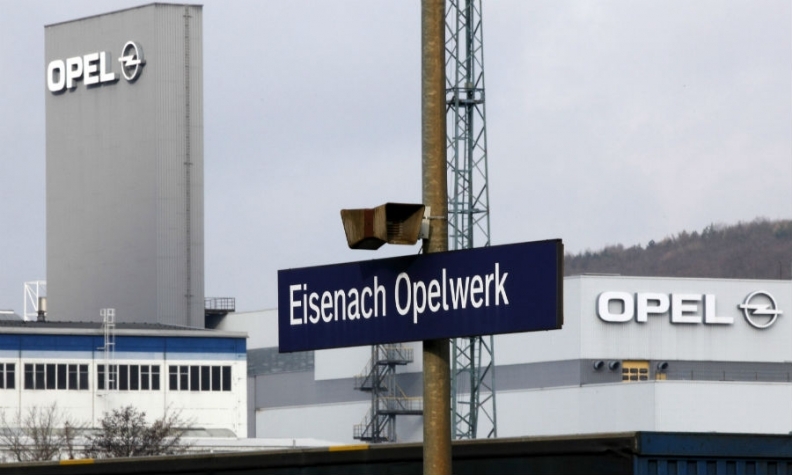 Opel's Eisenach plant is at risk as PSA seeks to reduce production costs. HAMBURG -- PSA's fight to cut production costs at Opel's German factories took on a national dimension with Chancellor Angela Merkel intervening to say she expected the French automaker to honor commitments it made when it bought Opel from General Motors last year. Merkel's comments came as Opel CEO Michael Lohscheller said some of the automaker's German plants cost twice as much to run as PSA's other factories. At stake is the future of Opel's Eisenach plant, which employs 1,800 workers. Shop stewards earlier this week rejected wage concessions demanded by PSA in exchange for a commitment to invest in a production line for a new model there. Lohscheller told a town hall meeting at Opel's headquarters in Ruesselsheim, near Frankfurt, on Wednesday that profitability was improving but added: "In part, our factories were twice as expensive as PSA factories." Opel, which PSA bought from GM for $2.6 billion, has made losses for almost 20 years, and CEO Carlos Tavares has been frustrated in his bid to cut high production costs. Opel's German sites have so far been excluded from PSA's sweeping investment plans, and management has demanded that workers in Germany give up a Christmas bonus and other benefits to help increase efficiency. Powerful German labor union IG Metall union has said that PSA's cost targets per vehicle cannot not be met without management's making concessions on pay, and have demanded that Opel's management fulfil its pledge of allocating more production to the Eisenach plant. Spiegel magazine, citing IG Metall sources, reported that Opel would need to cut the workforce at Eisenach to 1,000 from 1,800 if existing production plans were implemented and no new models were added to the production line. The magazine reported that Opel management now wanted only to produce a SUV in Eisenach, rather than two models, and that it planned to work only two shifts instead of three previously. Opel builds the Adam minicar and Corsa subcompact in Eisenach, according to Automotive News Europe's Guide to European Assembly Plants. Corsa production is due to move to Zaragoza, Spain, next year and be replaced at Eisenach by the successor to the Mokka SUV. On Wednesday, Merkel said: "The German government, along with the regional government, feels obliged to do its bit to help." PSA said last year that it would uphold job guarantees at Opel and Britain's Vauxhall. Analysts said at the time it would be tough to keep that promise.